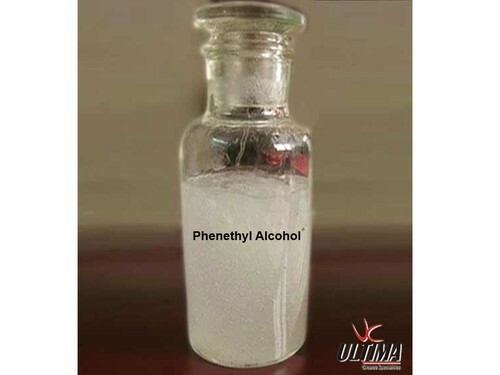 Phenethyl alcohol is found in extract of rose, carnation, hyacinth, Aleppo pine, orange blossom, ylang-ylang, geranium, neroli, and champaca. It is also an autoantibiotic produced by the fungus Candida albicans. It is therefore a common ingredient in flavors and perfumery, particularly when the odor of rose is desired. It is used as an additive in cigarettes. It is also used as a preservative in soaps due to its stability in basic conditions. It is of interest due to its antimicrobial properties. Established more than a decade ago by Mumbai based Entrepreneur Mr. Dinesh Mehta, Ultima Chemicals is one of the leading speciality chemicals Importer, Exporter and Contract Manufacturer in India. With a vision and a mission to do the ULTIMATE & create SPECIAL, ULTIMA CHEMICALS was started in the year 1997. Ultima Chemicals is a preferred partner of customers and suppliers in our key markets. We measure our success by our ability to fulfil customers’ orders with the highest degree of efficiency and reliability. Ultima Chemicals is a vertically integrated company spanning the entire pharmaceutical value chain from discovery to delivery with established credentials in research, contract manufacturing and marketing. We cater segments such as pharmaceuticals, bulk drugs & its intermediates, Agro Chemicals Fine Chemicals, Paints & Coatings, Printing Inks, Adhesives, Construction chemicals, Leather, Personal care, Water treatment, Textiles, Paper and related Industries.